Very happy with my purchase. Came a little bit later than I expected but in good protective packaging. All needed parts were included. Frame, acrylic and mat work great with my art piece. Compares with other store frames for a lot less cost. This site is so easy to order from. I received just what I wanted and what I ordered. Keep up the good work. Hello Christine! Thank you so much for your review! Most of our metal frames come unassembled except the Back loader Frames. Please consider one of the Back loader frames if you are wanting a fully assembled metal frame. We have samples of the Back loader frames available. The SLVBLS is a prime example of a preassembled metal frame. If you have any additional questions, please don't hesitate to reach out to us. Happy Framing! 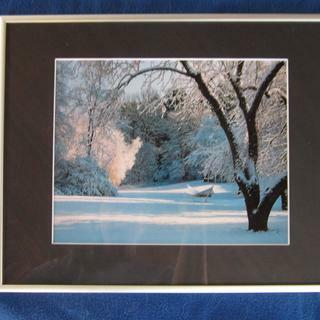 Very nice frame, perfect on snow scenes for either exhibit I'm considering, but the shipping costs are prohibitive for small orders! Otherwise I'd get another of these--( I have several of your matte black frames, also nice). Hello Kristina! Thank you so much for sharing your beautiful snow scenes with us! We certainly understand your concerns about shipping costs. We’d like to assure you that shipping charges are not a profit center for us. In order to make sure your order arrives in perfect condition, a lot of effort goes into our legendary packaging. Our shipping rates include actual shipping costs plus custom packaging materials, and extensive labor. Because we want to keep you as a customer, we do everything in our power to keep shipping costs as low as possible including periodic Free Shipping promotions. Please be sure you’re signed up for our email list to take advantage of these money saving opportunities. We do hope that when you have framing needs in the future, you’ll think of us. If there is anything else we can do to serve you better, please let us know. Happy Framing! Exactly what I asked for. 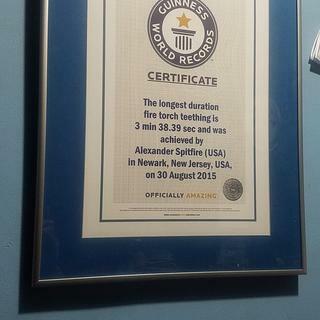 Came out the way I pictured it and fits my certificate perfectly. Such a great price, also. Thanks so much! I've been looking for these for years at a reasonable price. Very prompt service. One complaint is that shipping to Alaska is unreasonably high. Hello Larry! Thank you so much for placing your most recent order. We certainly understand your concerns about shipping costs. We’d like to assure you that shipping charges are not a profit center for us. In order to make sure your order arrives in perfect condition, a lot of effort goes into our legendary packaging. Our shipping rates include actual shipping costs plus custom packaging materials, and extensive labor.Because we want to keep you as a customer, we do everything in our power to keep shipping costs as low as possible including periodic Free Shipping promotions. Please be sure you’re signed up for our email list to take advantage of these money saving opportunities. We do hope that when you have framing needs in the future, you’ll think of us. If there is anything else we can do to serve you better, please let us know. Happy Framing! Product was of very good quality. I just wish it would have come to the size I ordered because the glass was already cut to size. Thank you for sharing your feedback. We are very sorry to hear that there was an issue with the sizing of your frame. We certainly want to make sure that we get the correct sized frame out to you. At your next convenience, please contact us at 1.800.332.8884 between 8a-7pm eastern standard time Monday-Friday so that we help to resolve this matter. We will await your call. The frame was excellent in all ways...looks and quality! It was easy to assemble and just what I wanted and expected. Had a small issue but customer service took care of it immediately. Definitely will order again. I have used these frames for almost 40 years, and I still love them. They come in many colors to suit your picture, they are easy to assemble, and I love the fact that you can order them to an 1/8 of an inch. I highly recommend them. This frame is beautiful and perfect for its intended purpose...to fit in an unusual space and highlight a piece of new media my artist daughter has started working with. I couldn't have been happier with the way it turned out. Very high quality frame - Great value! The frame is very high quality. We order a 40"x40" and it arrived very well packed with all of the bits and pieces needed to put it together. I was able to source glass from a local car glass place for a good price and get a mat cut at hobby lobby for a good price (although it took two visits and it is not quite right still) and get some light weight foam core for the back. Putting it all together was a bit of a challenge, but likely only because of the enormous size and the many pieces that needed to come together - frame, mat, photo, backing. The only thing that didn't work so well was the hanging wire. It was too thin to bear the weight of everything put together and it snapped... Luckily that happened just when lifting it and not when it was already hung on the wall. We got some heavier gauge wire from Home Depot and it is hanging well. All in all, very impressed and will likely order frames from here again in the future. Slim profile, perfect for a stairwell. High quality metal frame, looks great on the wall! Had an small issue with a large order. Called customer service and they quick resolved the problem with no drama!! couldn't be happier. Got a large free poster I loved and wanted a decent but reasonably priced frame. This frame not only looks great but was sooo easy to put together. Corners fit perfectly! The plexiglass is just as clear as glass, required no cleaning, and makes the finished product very light! Give this company a 10!! 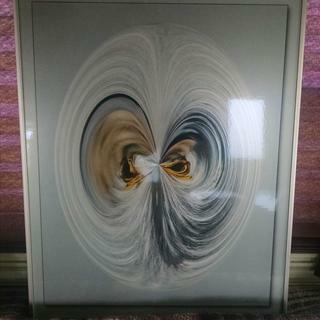 PERFECTLY FIT MY PROJECT AT AN ECONOMICAL PRICE; THE TOTAL VALUE OF THE FRAME AND MY POSTER MADE AN UNFORGETTABLE GIFT. I've been dealing with picture frames.com/graphik dimensions for more than 40 years. They take great care in the packaging and shipping of their products and their products are always delivered within a few days. Most of my purchases have been metal section frames and occasionally foam core backing and acrylic glazing. The frames are of the highest quality and the price is very reasonable. Just the ticket for a photographer mounting a gallery show or for use in the home. This frame was cut perfectly; was easy to put together; and arrived quickly. I will definitely purchase from picture frames.com again! I was happy with the quality, the pricing, and the professional shipping of these frames. The only thing that I had to watch for was some slight traces of oil residue left on the frames from the cutting machine. I did have to wipe down all angles of the frame pieces in order that there was no transfer of oil to my vintage advertising items. An oil transfer could ruin the value of most collectibles. These frames help to nicely display my collection of vintage advertising. Nice frame that looks great. The price was more than I expected to pay but I needed it to match two other frames. The frames are sturdy and easy to put together. The brushed silver is not too shiny so I like them better than the glossy ones. All the pieces for construction are included and fit perfectly. Hello Sandra. Thank you so much for your feedback. Unless otherwise noted on our site or catalog, our frames don’t automatically include acrylic glazing and foam core backing kits. We don’t sell glass for frames, we sell picture-frame quality acrylic which is plexiglass. Glazing and backing kits are not included automatically because not all artwork or customers need them for framing. Canvas paintings, for example, would be damaged by glazing of any kind. These are offered as separate add-on items during the ordering process which can be added after a frame size is selected. If you require acrylic and backing please give us a call at 1-800-332-8884. Thank you again for your business and have a great day! The frame is very nice. Definitely feels much more solid and costly than I thought it would. Easy assembly and perfect fitment. At first I was sent the wrong frame, but after contacting customer support, I was rush-shipped the correct frame at no cost and not hassle. I was able to frame these prints and now they are heirloom quality not just thrown up with cheap frames. These look so nice. I love these frames. This frosted silver color was exactly what I expected and my art looks professionally framed. The frames were very easy to put together with all the necessary parts included. I appreciated the enclosed foam bumpers for the back of the corners to prevent any wall scarring. It worked perfectly with my photo looks fantastic. Yes it is a frame and it came together very easily. When done my artwork was framed. Very easy. No problem. As expected. These frames are quite nice for a matted drawing or poster. I would like them a lot better if they were a full one-inch deep. Being only 3/4-inch deep, they're not as elegant as they might be. Hello Keith. Thank you for your review. These very popular frames are meant to be used for the exact purpose that you mentioned; for posters or photos on paper. 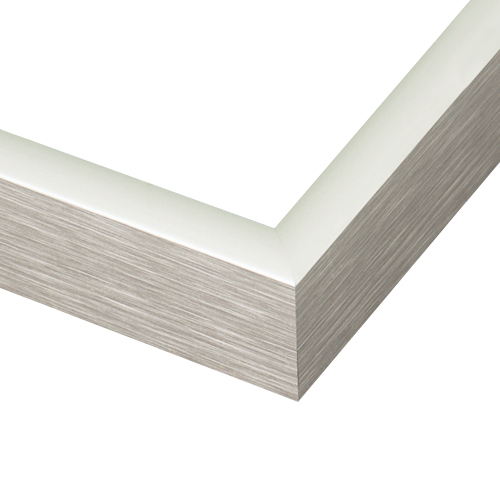 We have a collection of Metal frames with a 1"depth that has a very similar profile. Please check our 'New Canvas' collection which are used to hold a canvas. If you need more assistance, please give us a call. We can be reached at 1-800-332-8884. Happy Framing! My artwork is exactly 22 x 30". Given that I felt I should have a smidgen of airspace I ordered them a 16th inch oversize. I'm quite sure that they came out about 3/16 over. This required that I use shams all the way around of cardboard paper which was a big pain. I think if you have somewhere on your website that you should send net dimension without allowance for spit any space would be advisable because you in your sizing add some small amount to the net size ordered by the customer. This doubling of the error made the use of these picture frames very difficult. However after using all the spacers and clipping them and they are quite beautiful. Next time I will call before I order to make sure that I don't have this problem again. Hello Leslie. We appreciate the new order you placed with us. Thank you for taking the time to provide your feedback. We constantly aim to make any necessary improvements. I can understand your concern regarding the inside dimensions of the frame being larger than what you expected. Being that you are a first time customer, I regret that we did not clearly indicate that our frames are cut by 1/8" instead of 1/16". We also add 1/8" allowance to the width and height of the frame. I would like to send you the frames cut to the correct size that you need. I understand you improvised with the material you received, and that took tremendous effort. Therefore, if you are not inclined to receive a replacement, we will refund you for the order. Please give me a call at 1-800-332-8884 or email me at customercare@pictureframes.com. Attention, Shea. We look forward to finding a viable resolution. 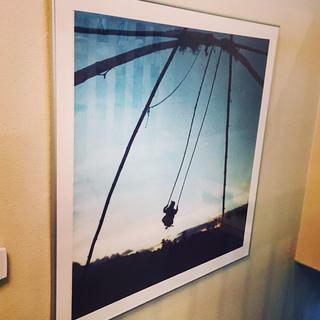 the size I ordered (54 x 12 inches) can not be hung with the material provided. The wire has to be fixed at the 2 small sides, otherwise the frame bends. The wire delivered did not allow that. The problem was easily solved by using another wire. Considering the price, it was a good buy. Hi Elisabeth. Thank you for your review. We appreciate your feedback about your hanging materials and will pass this along to our production team. If there is anything else we can do, please let us know. We appreciate your business and hope to serve you better in the future! The quality and the price is excellent but the frames were small for canvas pictures. So I ended up with 2 frames, I cannot use. This frame is such a pain to put together. After assembling and disassembling it for 10 times I still cannot allign the corners. The picture does not stay put in it. So i orders 4 metal sticks. Just miserable. I've been using these frames since the 70's and, I hate the hangers on the metal frames available in retail stores. Chose to update existing artwork. Simple, clean and modern. needed a frame with exact measurements. Good pricing allowed me to splurge on matting and archival quality covering. To give my pastel paintings a more contemporary look. Goes great with Biscay Blue mat for aviation print. 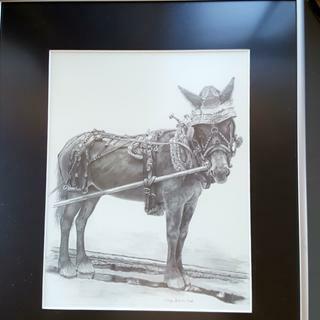 This frames compliments artwork as well as black and white photography. The color worked with the photos we are framing and the frame is a clean contemporary design. Combination of price and the frosted look I believe would look nice with my nature photography. The economy metal frames from PictureFrames are perfect for my home framing projects. Excellent quality, easy to put together myself and save money. Their customer service is excellent if there is ever a question or problem. 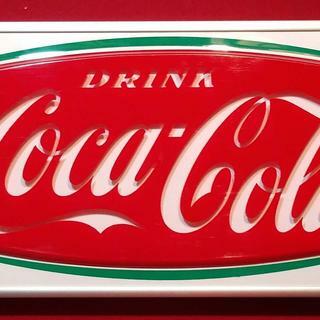 Best to go with the glass, antique telephone booth sign. It seems durable and will look stylish with the piece. It is a good price for the frames I need. Good value. Makes a nice uniform display on my art wall. silver frames mix well with frames of other colors - it's the new black! This type of frame works best to frame hand embroidered pieces using a backing board. sleek and shows art work. matches other frame work in my home. This style of frame goes nicely with my watercolor painting and is acceptable with my watercolor society. I needed something with a modern look that wouldn't make the room look small. 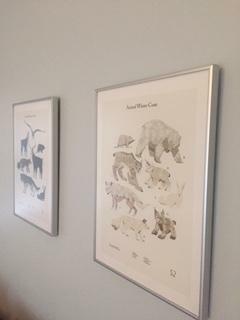 Have used frames from Graphik Dimensions before and have been pleased with quality. Best price on- line and chat with framing expert made sure I ordered right size. I frame paintings on Masonite. Need simple finish. 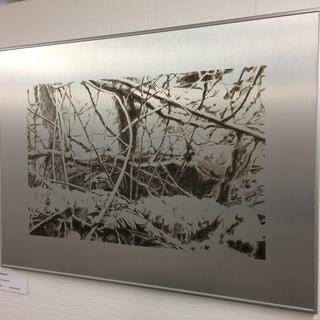 Plain silver with white mat is best gallery presentation. Elegant and professional. They were the design I wanted and I was able to purchase JUST the frame--no backing ; no glass/acrylic. And the price was right! The thin softly tinted edges will go great with my fine art floral. Looking for frame that can "dissapear" and let the art gets all the attention. Looking for slim, low profile frame. I think metal is a classy frame material for a modern art print. Silver is not overly showy. I bought for a stain glass window a friend made me. This time I bought the frame first so my friend can make the window right in the frame. BEST ANSWER: Thomas we do have a frame similar to the 111FSL with a depth of 1". See the image below of the NCWe also have Canvas Floater Frames that are 1 5/8" in depth. We do not use glass with Floater Frames nor do we recommend using glass on a Canvas. Hi, I am looking to frame a square silk scarf (107cm x 107cm). I wanted a silver/clear/white frame - do you know if this model would work well? BEST ANSWER: This is a brushed silver rather than a shiny silver frame--if that's what you want. This would work depending upon the colors in your silk scarf. I used it to frame a white glossy card with beautiful lavender writing for the poem. It turned out beautifully. It's a keepsake for my granddaughter. Hi there. Are use these frames for most of my watercolors. They are well-made and easy to put together. I’ve never mounted a suit scarf but I imagine that on foam board and even a mat, that would look great. The frames are very well-made and easily put together . I'm very satisfied with this frame. It has a soft, light silver finish and looks very elegant. I would like a metal floater frame for a 30Hx40W 1 1/2 inches canvas art piece. Is that something you offer and if yes, what's the info needed to purchase it? BEST ANSWER: Thank you for your inquiry. 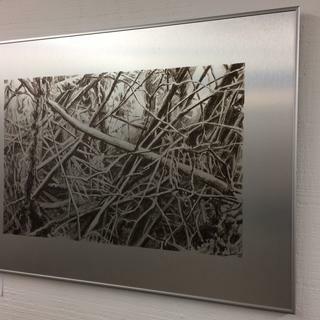 Please see https://www.pictureframes.com/Metal-Picture-Frames?c=canvas-floater for our metal floater frame selection that accommodates the 1 1/2" depth. If you have any additional questions please contact our customer care team at 1-800-332-8884. Our team of friendly experts is always eager to help! This particular frame is not suitable for use as a canvas floater frame. It's not deep enough. There are other frames in the catalog that are suitable for your purpose. BEST ANSWER: Hello Gail. This beautiful frame does not come assembled. You can order just frame only without glass or backing. Thanks! Can I make a frame to hold 3 pictures that are 3.5 x 5 each? BEST ANSWER: Hello! Thank you for your inquiry. We have the option available to add a mat with three openings to a frame. Or perhaps if you could consider adding a mat around each image, we have frames with three multiple openings set to a size, 5"x7". See below a sample of one of those frames in a barn wood style. If you would please give us a call at 1-800-332-8884, we will be glad to further assist you. Happy Framing! I’m going to be using this frame for a foam core mounted map. The foam will be 1/4inch thick plus the laminated map on top. No glass. Is this frame deep enough? I know the rabbet is 7/16 but I want to double check before I order. Thanks! BEST ANSWER: Hello Samantha! This frame will work just fine with your laminated map on foam core. If you need further assistance, please let us know. Thank you for your business! BEST ANSWER: Hello! Thank you for reaching out to us for your framing needs. The 111FSL is indeed made of aluminum. The frames are designed to hang inside and we can not guarantee the longevity the frame will have outside. However, we have had customers that use our frames for outdoor purposes. If you have any additional questions, please let us know! Have a great day! BEST ANSWER: Hello Cynthia! Thank you for reaching out to us for your framing needs. The depth/rabbet of the 111FSL frame is 7/16". Thank you for visiting pictureframes.com. Have a great day! what size frame do I order for an 11 X 8 and one half inch document? BEST ANSWER: Please order the frame size to be the same size of the document. 11"x8 1/2". Can you get just the foam core board without the acrylic? BEST ANSWER: Hello Barbara. Yes, you can order the foam core without the acrylic. You will need to call our Customer Care Department at 1-800-332-8884 so we can grant your request. We can be reached at 1-800-334-8884. Thank you!